In September 1493 King Charles VIII of France crossed the Alps with a formidable army, throwing Italy into political chaos. 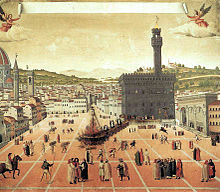 Many viewed the arrival of King Charles as proof of Savonarola's gift of prophecy. 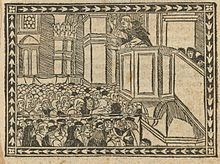 Charles, however, advanced on Florence, sacking Tuscan strongholds and threatening to punish the city for refusing to support his expedition. 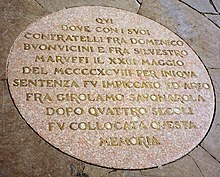 As the populace took to the streets to expel Piero the Unfortunate, Lorenzo de' Medici's son and successor, Savonarola led a delegation to the camp of the French king in mid-November 1494. 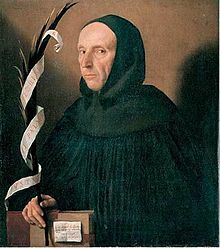 He pressed Charles to spare Florence and enjoined him to take up his divinely appointed role as the reformer of the Church. After a short, tense occupation of the city, and another intervention by fra Girolamo (as well as the promise of a huge subsidy), the French resumed their journey southward on 28 November 1494. 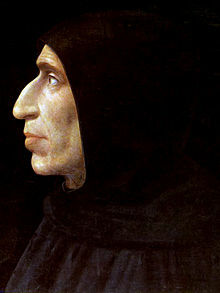 Savonarola now declared that by answering his call to penitence, the Florentines had begun to build a new Ark of Noah which had saved them from the waters of the divine flood.